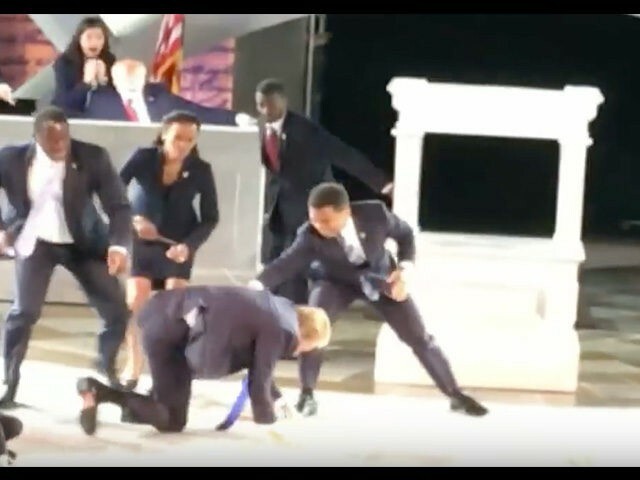 By now, we’ve all heard of the Shakespeare in the Park rendition of Julius Caesar that puts President Trump in the starring role to be assassinated on the Senate floor. It went on for weeks before anyone raised a red flag over it as incitement to assassinate a sitting President. Well, two protesters last night crashed the performance. One of them was arrested for their efforts to stop the travesty. Laura Loomer, formerly of Project Veritas, rushed the stage shouting “Stop the normalization of political violence against the right! This is unacceptable!” An announcer halted the production and boos from audience filled Central Park’s Delacorte Theater. Loomer also posted a first-person-style video of herself rushing the stage Friday night. She was reportedly charged with disorderly conduct and trespassing, and, according to her social media accounts, was released shortly after her arrest. The Public Theater posted a statement to Twitter Saturday blaming the incident on “paid protesters.” “While we are champions of the first amendment, this interruption unfortunately was part of a paid strategy driven by social media,” the message read. I guarantee you those were NOT paid protesters and they know it. The New York Times and CNN’s parent company Time Warner are standing by their sponsorship of this abomination. Production of the play ends tomorrow. Good freaking riddance. But it sure doesn’t end the boiling cauldron of hate out there that is going to get people on the right killed. Notice how Laura Loomer was immediately arrested, but when leftists protest, they walk. Talk about a double standard. I think the right has had enough of this crap and they are finally just beginning to fight back.